This undated photo shows Chef Sean Sherman, a winner of a 2019 James Beard Foundation Leadership Award, preparing apple blossoms. The award acknowledges Sherman's efforts to decolonize the Native American diet. 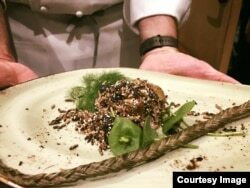 A dish created by Lakota "Sioux Chef" Sean Sherman, which features elk, wild rice, fern fiddlehead, berries, spring onion and sunchoke. "The broiling of their fish over flame," an engraving by Theodor De Bry, 1590. Courtesy of the John Carter Brown Library at Brown University. Prior to the arrival of European settlers, tribes hunted, fished, gathered and farmed a wide array of animals and plants, depending on their locations. By the late 1800s, forced onto reservations that were often far from their traditional homelands, tribes were restricted in their rights to hunt, fish or forage for wild food and forced to make do with U.S. Army rations of flour, lard and salt—ingredients alien to the indigenous diet. The rations were later replaced by the commodity food program. "That has never been a nutritional program, and it has contributed to the health epidemics that we see in tribes across the country--mass obesity, mass rates of heart disease,Type Two diabetes—you name it," said Sherman. "A change has to take place, and this is the best way to start to utilize the lessons of our ancestors that would have been passed down to us, if it hadn't been for cultural assimilation efforts. 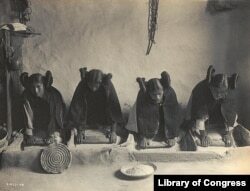 This 1906 photo by Edward S. Curtis shows Hopi women grinding grain into flour. 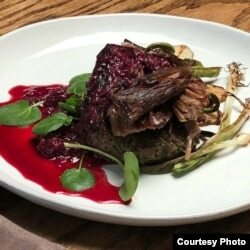 Sean Sherman prepared this modern version of a traditional Lakota dish, Wasna, made with duck, popped wild rice and amaranth, foraged fennel and miners lettuce at the 20th annual World of Flavors at the Culinary Institute of America, St. Helena, Ca.